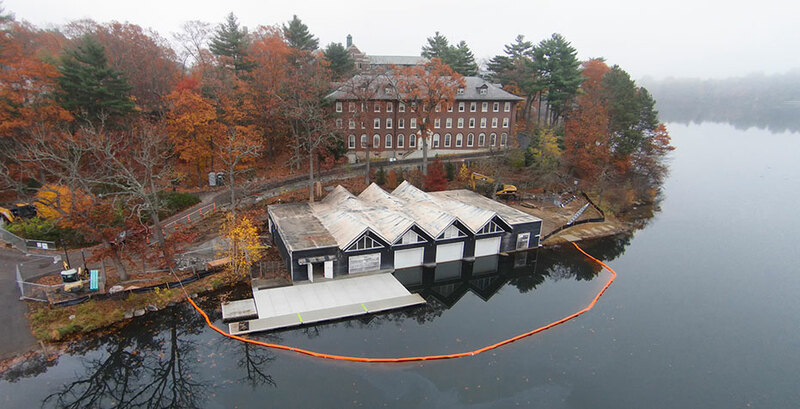 Thanks to the generosity of Alice Butler ’53 and her husband, John, the boathouse on Lake Waban is undergoing a comprehensive renovation to update and upgrade a facility used by Physical Education, Recreation, and Athletics. The current boathouse dates to 1963, and has never had any significant updates. Alice Butler was an avid member of her dorm crew, and she and her husband are lifelong fitness enthusiasts. Their gift fully enables much-needed work to renovate this structure, and supports other PERA initiatives as well. Work began right after Family & Friends Weekend and Homecoming, and continues apace. Water barriers and fencing were installed around the perimeter of the boathouse in anticipation of the building’s renovation. This environmental safety precaution, among many others at the site, prevents any project materials from escaping into the Lake, and also mitigates the spread of lake bed silt being stirred up by construction activity. The building will be completely renovated and made more accessible, creating a new main entry, prep room, improved shop space, canoe/kayak room, and storage. The project will also revise and improve the north end of site, addressing soil erosion and drainage issues while making the renovated building a more successful gateway to Lake Waban. Site work and landscaping and renewed building finishes will also create a more inviting entry, and improve the relationship between boathouse and campus. For more details about this project, see our Campus Renewal pages, and for updates on related road and pathway closures, check out the related blog, The Dirt.